During the darkness of a waning moon unspeakable things skulk from the depths of Dreadmire, infesting the surrounding heath, farmlands and ranches. It is said that those who go in rarely return - at least not alive. This expansion quagmire is a source of deadly diseases, demon cults, fatal venoms, immersed ruins, and ancient magic. The combined forces of the giant owls, wild elves and quag druids cannot save the sinking forest. The ubiquitous dark pollen is corrupting all that lives, perpetuated by the malicious tree devils and the malevolent Somesuch. Dreadmire Swamp is the definitive reference book on adventure, life and unlife within the swamp. Here you will find verisimilitude: rules covering swamp ecology and hazards, complete encounter tables, and descriptions of harried villages, as well as details of nearly three hundred new creatures. 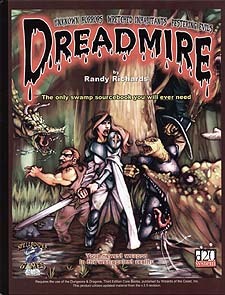 There is ample room for thrills in Dreadmire, as simply trying to navigate a bayou is a dangerous prospect. Three complete adventures also await parties brave enough to stare into the Dreadmire's thousand eyes, taking PCs from beginning to advanced levels. Beginners brave the wetlands in The Great Bayou Halfling Boat Race. Intermediate player trudge across the Bog of the Fungal Demon, avoiding black slime and abysmal shrooms. Finally, Secrets of the Sinking Citadel vexes even the most advanced players against nine eldritch liches that survived the Age of Necromancer Druids. Both game masters and players will find a wealth of information about the swamp, from background information on isolated communities, to new monsters, new spells, new weapons, new magic items, and new classes, all suitable for any level of game play, and easily adapted to any campaign setting.